Sure, it’s September, so most of us in this hemisphere are buried in big harvests. Did you know there are probably plenty of small ones out there waiting for you too? I swear I am not piling on, you harvest-weary souls in bloggerland. 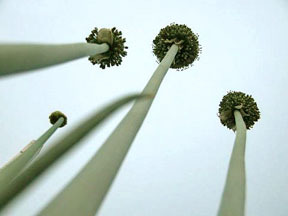 All I mean is there might be a few more little, perhaps overlooked things growing in your back forty that could augment your winter and spring dinners. I am, of course, talking about rounding out your pantry by looking for…condiments! 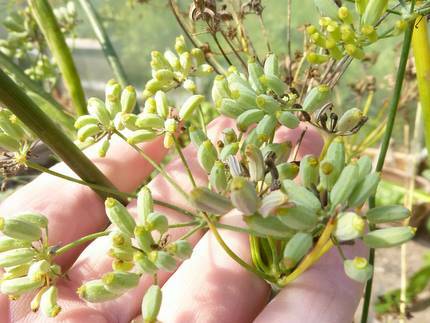 Look under the withered buds for the seedpods: you’ll see 2-4 of them, usually. Try to get them while they’re still small. They’re quite peppery! It’s now that I attend the garden armed with little bowls. 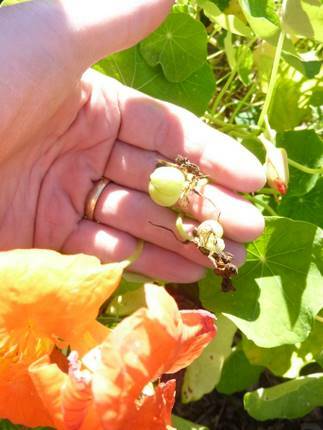 Nasturtium seed pods are slowly ripening, you see, and so it’s time to put by a store of home-grown capers. 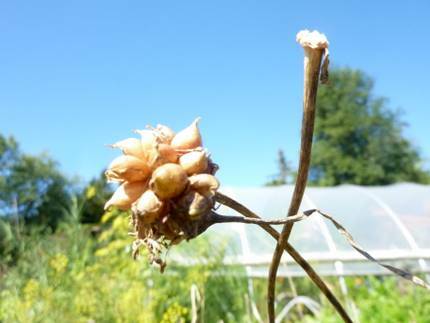 My patch of free-sown garlic has drying tops of bulbils singing in the breeze, and the fennel and cilantro has gone to seed: these, too, can be pickled or dried. I see that many of the paste tomatoes are ripening well ahead of this weekend’s timed harvest. Tomatoes can be sliced thin, placed on parchment-lined cookie sheets and sent to the oven for a 200-degree beating overnight…insta-“sun”-dried goodness, especially if sprinkled first with sea salt and fresh thyme. These go into the freezer to be dispatched at will this winter. And then there’s the ripening apples. Ch-ch-ch-chutney…! when paired with green tomatoes, garlic, a wee bit of hot peppers and sugar/vinegar. The pantry has yellow and brown mustard seeds. Those few small Italian plums left from last week might make a great mustard, paired with an apple or two. Not-quite-ready grapes yield small very precious bottles of verjus: lip-puckery brightness if a few drops are shaken out atop a hot dish. Over the years I have cut out all condiments from the grocery store list, and it’s only gifts from far-flung locales that stock the top shelf of the fridge. Cranberry ketchup, garlicky barbecue sauce…these are well within your range, especially in small batches. Small refrigerator pickles like the nasturtium pod “capers” likewise aren’t hard (just 1T salt in a near-pint of white vinegar: add the pods as they ripen). Look around, find that second harvest. I think I like fennel seeds and pollen more than I like the bulb. And: it’s fun doing something small when all you’ve been doing is putting huge monotonous harvests away. Trust me on this, truly. I could not agree with you more, it’s the little things that add variety and add up on the pantry shelf. These crops take but a short time to harvest and process and make a ‘something special’ when it’s gloomy outside. Good job making the most of your gifts! I aspire to be you when I grow up! I’m a HUGE fan of fennel seeds. Among other lovely things they can do: tossed in a nice vodka and left to steep a month – then served very cold, neat, in iced glasses – well, it’s better than most of the pricey flavored vodkas anyday! Hayden,Never thought of fennel seds.I do it with whole black peppercorns. 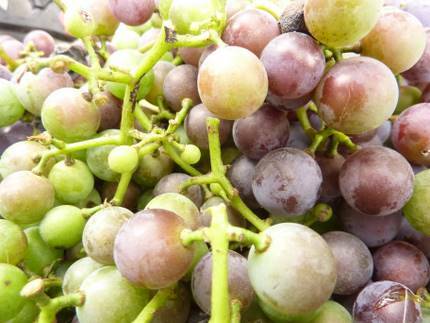 How do we make verjus? I’ve searched online and there isn’t much on making your own. Some blend and strain, others mention crushing with a pestle and more just don’t say how to juice. Do you add sugar and or alcohol? Should we store it in the fridge or can it? Pam, indeed! Variety being the spice of life and all that…let’s just say I like to produce a bit more than the same-old. And you too, apparently. Hayden, you mixologist you. I’m not much of a fan of vodka but wow that does sound good…and thanks for making the suggestion. Good ideas are to be shared! John, pepper, yum. You’re warm enough over there: can you grow a pepper plant? Quite beautiful in their tropical foliage. Sylvie, well, if you ever can let your fennel go to seed, the pollen shaken atop plain chevre is just divine. Nice green taste. I like having my own dried herbs too: one day I shall make a post about it, maybe. I assume you make your own blends for your pantry, right? Beth, sorry to be vague. I crush the grapes in a chinoise (a fine-mesh funnel with a wooden pestle) then the remaining seeds/skin through a food mill, trying to just get as much juice as I can. It will oxidize (turn ugly brown) if I don’t work fast enough. I strain it through three layers of butter muslin (fine cheesecloth). Then I add two things to help preserve it: citric acid and sodium metabisulfide, two things I have on hand for cheese- and winemaking. It goes in the fridge, the sediment settles, I decant it into smaller jars, and voila, verjus. Kind of sweet, kind of tart, better than vinegar. Not anytime this year, unfortunately. Maybe next!